If a major disaster struck your city today and forced you to fend for yourself, what in the world would you do? The majority of people would, unfortunately, not be prepared for a worst-case scenario at all. They would end up begging others for help and finding out how difficult it is to live without many of today’s modern luxuries. Don’t fail to plan for the worst and put yourself into this scenario! Rather than risking your life by choosing not to take the proper precautions, equip yourself with the survival tools you would need to survive any kind of disaster. You’ll be glad you did when you’re not forced to beg people to help you survive. You’ll also give yourself a much better chance to survive with the right tools in your back pocket. Here are 11 survival tools that everyone needs to have tucked away in their arsenal. When it comes to putting together a collection of survival tools, pepper spray might not be the first thing that comes to mind. You might wonder what good pepper spray is going to do you if you ever find yourself in an extremely dangerous situation. But you would be surprised by just how effective pepper spray can be when you’re face-to-face with a serious threat. Whether that threat is another person or some kind of animal, you can whip out your pepper spray in a matter of just seconds and get rid of the threat in no time. Each pepper spray is a little different. But most feature anywhere from 2 to 5 million Scoville units. That makes pepper spray significantly hotter than even the hottest of hot wings and hot peppers. One or two sprays of pepper spray can neutralize the largest of attackers and allow you to escape to safety. Pepper spray also continues to work for up to 45 minutes in most cases. While pepper spray is an essential survival tool that people should keep around in case of emergency, it’s far from the only small survival tool you need in your arsenal. There are also other small survival tools that’ll do the trick if you ever find yourself in a disaster scenario. One example is a self-defense keychain. It can protect you if you ever find yourself on the wrong end of an attack. Self-defense keychains are, at first glance, very unassuming. Most people won’t think much of one if you have all of your keys on it. But it can actually do quite a bit of damage when you use it to your advantage. The most basic self-defense keychains will allow you to strike someone if they ever attempt to attack you. But there are also more advanced options that will allow you to penetrate the skin and stab a person or animal during an attack. A spiked impact device, for instance, looks like a cute and cuddly cat when you first look at it. But it has two pointy ears that you can use to inflict some serious damage on someone if they come after you. You’ll feel a lot safer overall when you’re walking around with any kind of self-defense keychain in your pocket. You really can’t talk about survival tools without bringing up tactical knives in the conversation. You need to have a tactical knife if you’re going to put together an arsenal filled with different survival tools. So, what is a tactical knife? It’s essentially any kind of knife that you could use during a fight if you had to. The average tactical knife is usually anywhere from 4 to 8 inches long, and it can be opened and closed by using just one hand. A great tactical knife should sit somewhere in the 4 to 5-inch range. It should have a no-slip handle that makes it easy to grip and a spring inside that makes opening it a breeze. You can also find fixed knives that don’t open and close when searching for survival tools. They’re not always quite as convenient to carry around since they take up more space, but they’re another solid option if you prefer the way they look and feel. But whatever you do, don’t try to put together an arsenal of survival tools without considering which knife you’ll need. You’ll find that you’ll use a knife for everything from fighting to cutting through brush, debris, and more in a survival scenario. Do you want to put something in your survival pack that’ll do almost the same job as a tactical knife without being so obvious about it? A tactical pen might just be the next best thing. It’ll allow you to protect yourself from anyone who tries to attack you without forcing you to whip out a knife. The Cold Steel Pocket Shark is a great example of a tactical pen that could save you during an attack. It looks exactly like any other permanent marker that you would find out there in the world, except that it has an extremely sharp point and high impact polymer walls that are about 4 times as thick as the walls on a regular marker. If someone sees you carrying a tactical pen like this around, they probably won’t think anything of it. But in reality, you can protect yourself and others with it if you don’t have time to whip out a tactical knife. If you were forced to build a fire during a disaster, would you have any idea how to do it? Those who enjoy camping and hunting a lot probably would be able to gather the things they would need to make a fire. But a lot of other people would be left out in the cold, figuratively and literally, when it came time to try and make a fire. A Ferro rod would be a huge help to those looking for a hand while making a fire. It’s a rod that is made up of several different types of metal, including cerium, iron, and lanthanum, and it’s designed to create sparks when you rub it against another surface. It’s still a good idea to educate yourself on how to start a fire without using a Ferro rod. But if you have one around the next time you need to make a fire, you won’t have to worry about doing it the hard way. Whether you’re assembling an arsenal of survival tools or not, everyone in America could benefit from having a multitool in their home. 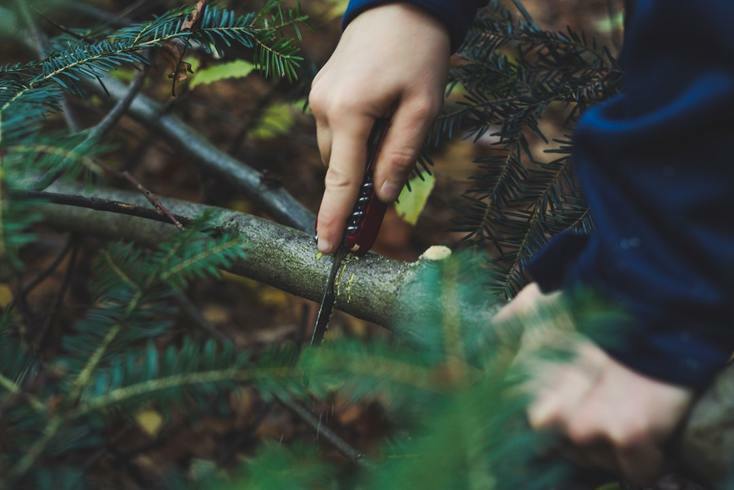 Multitools have a bunch of different tools jammed into one tiny package that is easy to use. These days, there are even some multitools that have things like flashlights, magnifying glasses, and USB sticks built right into them. You’ll be able to do so many things with a multitool when survival is your goal. You shouldn’t ever leave home without one. If you want to keep your survival tool arsenal small and compact, you might think that a hatchet would be too large to put in it. But there are plenty of small hatchet options for those who want to limit the large tools that they have to carry around. Additionally, a hatchet can do more than just chop down small trees and cut other things up. It can also replace about three or four other tools that you might be thinking about adding to your arsenal. When you have a hatchet on deck, you probably won’t need to worry about investing in a shovel, a wrench, or a tool for prying things open. Your hatchet can do the same jobs as these tools and, in some cases, it can even do them better. Just make sure you don’t purchase a hatchet that’s too big or too heavy. Stick with one of the smaller hatchets on the market. When most people think about survival tools, they think about tools that they can use to harm anyone or anything that might attack them. And while most of them do fall into that category, all survival tools don’t need to be able to inflict pain. A tarp would be an excellent example of this. You’re probably not going to be able to protect yourself with a tarp unless you decide to get extra creative with it. But you can use a tarp for quite a few things when you’re trying to survive. A tarp can be used to protect your belongings if you ever get caught in the rain. You yourself can also climb under a tarp and get out of the cold and rain during bad weather. Additionally, you can utilize a tarp to send signals to other people if you ever get stuck somewhere and need assistance. And you can even turn a heavy-duty tarp into a stretcher that you can use to transport someone who has been injured during a disaster. Tarps aren’t terribly easy to carry around and will take up some space in your arsenal. But as you can see, there are so many advantages that come along with making extra room for them. When you see someone trying to get out of a disaster scenario on a TV show or move, 9 times out of 10 they need to use a piece of rope at some point. And there’s a good reason for that. Rope can really come in handy when you’re attempting to carry out any number of tasks. You can use the rope to build an emergency shelter. You can use rope to climb up and down hills and to scale walls and buildings. You can even use a rope to tie things together or to keep a splint in place if you sustain an injury. Rather than relying on a regular old rope, though, it’s best to go with something that will prove to be strong and reliable. A paracord is probably your best option if you’re in search of rope for your arsenal. In 2018, it’s easier to communicate with other people than ever before. More than 90 percent of Americans have cell phones, and that number is on the rise every year. It just keeps getting simpler to stay in touch with other people. But, what would you do if you didn’t have a cell phone handy? You would likely be in big trouble since you wouldn’t be able to speak with other people. That’s where a metal whistle would really come to your rescue. It might seem like a silly survival tool to put in your pack. But a metal whistle can make a lot of noise and let people know where you’re at during a disaster. Just be careful about when you use it. While it can alert your allies as to your whereabouts, it could also potentially let those who want to harm you know where you are, too. By picking the right time to use it, you can enjoy the benefits of having a whistle nearby. Honing your Urban Survival skills includes learning how to protect yourself and your loved ones during an emergency. However, not everyone likes the idea of using lethal force, even when it comes to personal protection. That’s where stun guns come into the picture. A stun gun, and its close cousin the Taser, is a non-lethal Urban Survival tool that easily slides into your get home bag (or EDC bag) yet delivers one heck of a punch that can easily incapacitate even the most aggressive attacker or looter. But which one is better? This stun gun vs Taser article will help you decide which one is the best survival tool to have in your corner. Whether you’re someone who loves a good outdoor adventure or someone who wants to be fully prepared for a doomsday scenario, you should have most of, if not all of, the survival tools listed here. Each of these tools will help you survive in an emergency in a different way. They’ll allow you to protect yourself while providing you with everything you’ll need to get yourself out of a tough spot. Check out our blog for more tips on choosing the right survival tools for almost any occasion. It’ll teach you more about all of the great tools that are available to you right now.